The Digital Research Library of Illinois History Journal™: Dr. A. Louise Klehm: Niles Center (Skokie) Illinois' First Lady of Family Practice. Dr. A. Louise Klehm: Niles Center (Skokie) Illinois' First Lady of Family Practice. Amelia Louise Klehm was born November 23, 1870 at the height of the Victorian age, fifty years before American women earned the right to vote. Yet never did she expect to be supported by a father or a husband, as was the case with many other Victorian women. Instead, she set ambitious goals for herself, becoming first a nurse and later a country doctor serving the people of her hometown, a little farming community called Niles Center, just north of Chicago. 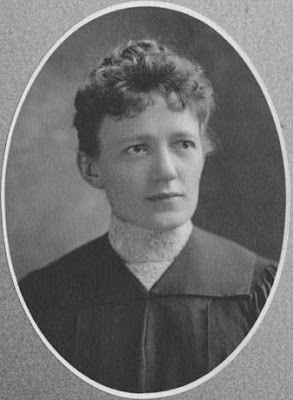 Klehm entered the University of Illinois Medical School in 1898, just as anti-female hostility reached its peak in the male-dominated medical profession. Determined to succeed, she remained undeterred by such distractions, and had the sweet satisfaction of graduating in 1902. An added pleasure was her father's admiration. Originally dubious about the wisdom of this undertaking, he was so proud of her achievement that he called her "doctor" for the rest of his life. Actually, George Klehm inflamed his daughter's determination to succeed. 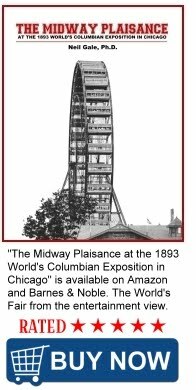 He was the quintessential self-made man, hard-working and persistent since his arrival in America at age twelve, when he immediately began laying the staircase of his own success with a bricklayer's trowel. Reaching for a higher stair as a young man, he used his trade as a stepping stone to a career in education, but soon realized he would never earn enough to support a family in comfort. Nevertheless, Klehm kept his job until early 1864, when he learned that fellow-immigrant Henry Harms wanted to sell his general store. Then, within a matter of months, he became both a fulltime store owner and a husband to Eliza Harms, Henry Harms' sister. By 1870, when the Klehms welcomed their fourth child, Amelia Louise, George was a prosperous merchant. He was also town treasurer of Niles Center and a pillar of the proud new St. Peter's United Church of Christ, which he had volunteered to help build. Klehm, in short, was living what later generations would call the American Dream. It did not last. Three weeks after the Klehms celebrated their fourteenth wedding anniversary, the dream became a nightmare. A bleak note in George's Bible tells the story: "Luise (Elisa) Harms Klehm, wife of George C. Klehm died of a heart attack on August 26th, 1878, shortly before midnight. She left behind a brokenhearted husband and six children." Brokenhearted or not, George Klehm had six mouths to feed. So it wasn't long before he lifted his chin, found someone to care for his children, and went back to work. 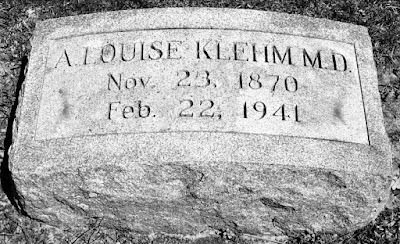 Louise Klehm (or A. Louise, as she preferred) was nine years old when her mother died; her sister Alma, the baby of the family, was a toddler of nearly three. Alma needed a constant watchful eye and big sister Louise was there to provide it; such compassionate vigilance could well have been a major factor when it was time for the elder sister to start thinking about earning a living. In the early 1890s Louise set her sights on becoming a nurse. It was a sound decision, considering the expanding medical field. New discoveries in both medicine and surgery, and most especially in the realm of antisepsis, made hospital hygiene impossible to maintain at home. As a consequence, many patients opted for hospital stays, thus sending admission rates soaring. The end result seemed to benefit every-one: patients enjoyed the best health care available, and nurses, ostensibly, enjoyed a seemingly limitless wealth of opportunity. Louise Klehm found these prospects so exciting that she entered the Chicago Baptist Hospital's three-year nursing program in 1893. Alas, disillusionment set in before graduation day, for Klehm was only one of thousands of young women with the same notion. Still, though the market was glutted with newly-qualified nurses, Klehm was a mature and intelligent student, and she graduated in 1896 with two offers of employment in hand - one from with a physician in Minneapolis, the other as assistant head of nursing at the hospital where she had studied. There was just one problem. Neither choice offered enough money to live on. Contemplating both with equally lukewarm enthusiasm, she turned to her usual source of wisdom and strength: her father, back home in Niles Center. George Klehm did not let her down. He gave careful thought to the question of his daughter's career before writing to her on September 18, 1896, at the Chicago Baptist Hospital. "The position of nurse for some eminent physician, would perhaps be all right, but... this doctor is at Minneapolis." A true father of the late Victorian Age, George pounced on this distance on the grounds that she would be away from all her relatives. "It would be rather dangerous," continued George, "to trust your fate to a strange man in a strange city, away from all relatives and before you make a move in that direction, you should have positive evidence as regards the moral character and standing of this physician." Far better, George declared, to accept the assistant head nurse position at the college, even though the salary was small. "Colonel," who carted Dr. Klehm to many a patient's bedside. Louise accepted her father's advice, but she was not in her hospital position for long. In April 1898, President William McKinley declared war on Spain soon after the mysterious explosion of the battleship USS Maine in Havana harbor. In company with nearly 1,600 other nurses, Louise enlisted in the Army Medical Corps and was sent to Miami to care for wounded soldiers in a new but unfinished hospital. But rigid standards of hospital hygiene not withstanding, the medical corps had reckoned without the patients themselves, who insisted on drinking polluted well water in preference to the boiled water provided especially for them. The result, predictably, was a raging typhoid epidemic. Plans for the hospital were hastily scrapped, and the 154 wounded from Illinois, with Nurse Louise Klehm in attendance, were sent back home to convalesce at Fort Sheridan, about fifty miles north of Chicago. Neither the Illinois nurses nor the soldiers missed much in the way of action. The Cuban battlefronts were silent by summer's end, and the Spanish-American War was over before the year was out. For Klehm, the time was ripe for a new challenge: medical school. She'd asked her father for advice about this some time earlier, but the letter he sent to her at the Baptist Hospital was discouraging. "The study of medicine would consume about four years of your life and the results would give you a chance to bury yourself in some charitable institution for the rest of your lifetime," he wrote, expecting the matter to be closed. But he had not reckoned with his daughter's determination. Louise had made up her mind to go to medical school, and medical school it would be. It was a difficult time for a woman to aim for a medical career. Across the nation the medical profession, a traditionally masculine stronghold, had cautiously welcomed the first 200 women into the fraternity by 1860. By 1880, 2,423 female colleagues had filled the ranks. But by 1900 more than 7,000 female physicians were clamoring for full acceptance. The patriarchy resisted. Women physicians, the besieged men blustered, were too unreliable. Matters such as chemistry and anatomy were subjects too taxing for the feminine brain. As if all this were not enough, cartoons supporting the medical establishment took delight in depicting women doctors daring to chart the profession's future course, and - worst of all - besting their male colleagues for the patient's dollar! Persistent hostility often drains the joy from ambition, but the twenty-eight-year-old Louise was not to go down in defeat. In 1898, with eyes focused firmly on her goal, she entered Chicago based University of Illinois, a coeducational medical school then accepting women for the second year in a row. She made a wise choice. Northwestern University, also Chicago-based, would soon bow to establishment pressure, abruptly closing its Women's Medical School just two months short of graduation. In contrast, students at the University of Illinois were secure in the firm support of their dean, William E. Quine, a man who was impressed by the dedication and hard work of his female students. In this serene atmosphere, Louise and her fourteen female classmates were able to do their best work, graduating together without incident in 1902. Klehm was lucky. One of her medical school instructors was Rachelle Yarros, M.D., a passionate supporter of both birth-control and adequate medical care for the poor. At the time of Louise's graduation, Yarros happened to be living and working at Hull House, Jane Addams' settlement house for Chicago's inner-city poor immigrants. Overworked herself, she gladly accepted the newly qualified physician for a three-month internship. 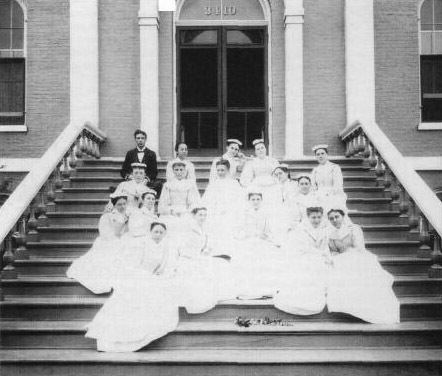 Louise Klehm's nursing class on the steps of Chicago Baptist Hospital. Klehm is seated at the far left in the next-to-last row. Brief as it was, this internship taught Klehm a great deal. She saw poverty so intense and painful - babies were born into the world without even a rag to wrap them in - that thereafter, she would always set aside food and clothing for the less fortunate. Likewise, Louise learned about the social and medical issues surrounding the prevention of "involuntary motherhood," and she delivered seventy babies, honing her skills so they were equal to any emergency. It was all very exhilarating, but it was also exhausting, and it took her into places of unbelievable filth. Characteristically, she tried to shield her family from the worst of it, but didn't always succeed. "When she would come home at night from delivering a baby or saving a dying man from pneumonia, she would stand in the bathtub and undress to shake the vermin from her clothing," her sister Alma later recalled. But three months of hands-on experience were not enough for Klehm: she decided to hone her surgical skills in Europe, specifically in Berlin and Vienna, where women doctors were more accepted. 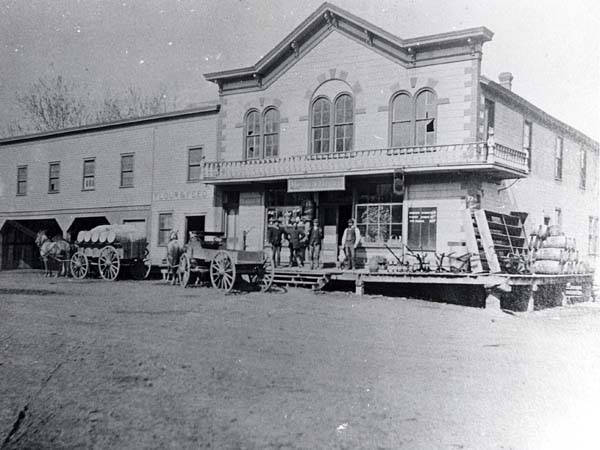 Dr. Klehm's first office was in Klehm Bros. General Store building at the southwest corner of Lincoln Avenue and Oakton Street. By the time she went into family practice in her hometown, A. Louise Klehm, M.D., was a highly-educated and poised woman in her mid- thirties. A portrait photograph taken at this time shows a calm, assured face with deeply chiseled bone structure and steady, self-confident gaze. The confidence was fully justified, buttressed as it was by knowledge of the latest techniques, and underlined by her two constant companions: the first, a case full of necessities for any needy families she might encounter; the second, a capacious black doctor's bag stocked with medications such as calomel (useful against for intestinal parasites), quinine, the emetic called ipecac, and aspirin, the latest wonder-drug. Sharing the bag were her instruments: stethoscope, thermometer, opthalmoscope and sphygmograph, plus scissors, needles and catgut for stitching, various scalpels and other cones for surgical use, and, of course, obstetrical forceps in case of difficult deliveries. 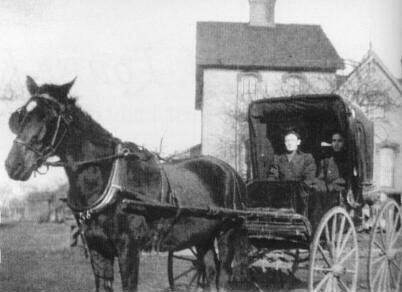 Her first transportation was a two-wheeled buggy drawn by sleek little pony named "Billy." the little two-wheeler gave way to a more elaborate buggy and "Billy" yielded to "Dan," who in turn was peplaced by "Colonel." 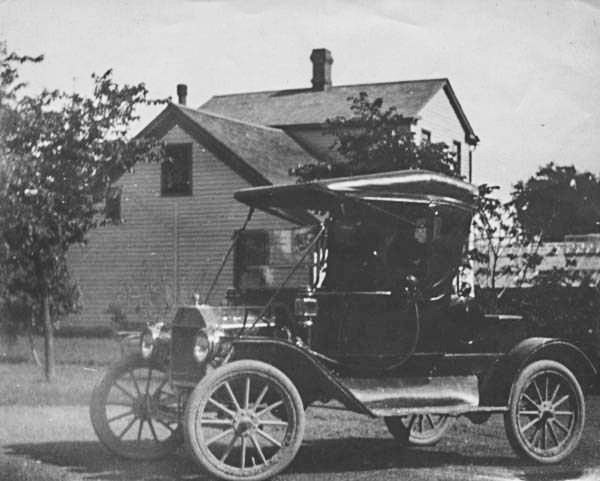 Dr. Klehm's 1912 Ford Model T.
When Dr. Klehm purchased a Ford Model T automobile in 1912, "Colonel" and the buggy were used only in bad weather when roads were impassable. While cranking the car one day, the engine backfired, breaking her right arm at the wrist. Three weeks later, her arm in splints, Dr. Klehm delivered a baby in neighboring Park Ridge. Surgical Kit with medical instruments used by Dr. A. Louise Klehm. Small brown leather surgical case snaps closed and folds open to reveal metal medical instruments and two pockets. 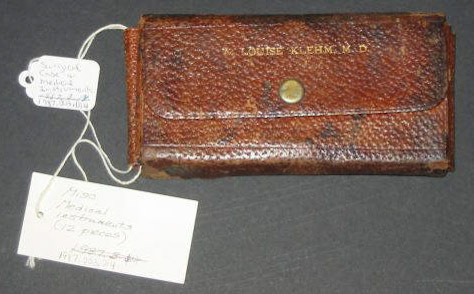 The front is monogrammed in gold with "A. Louise Klehm, M.D." Instruments include: 5 blades (scalpels) of varying size and shape, 1 surgical hook, 2 probes (picks) of varying shape and size, 1 with a scoop on one end, 1 hemostat (surgical clamp), and 2 curved urethral sounds with attaching screw-on handle. One scalpel is labeled Betz Company. Everything came in handy, for she never knew what she might find once she arrived at a patient's bedside. Sometimes there was a well lighted bedroom, clean and conveniently close to St. Francis Hospital in neighboring Evanston, where she was on staff. More often she found herself delivering a baby, or setting a broken bone in a lonely farmhouse lit by guttering oil lamps, with only a trembling member of the patient's family to assist. Despite the hours of travel and the long nights at a patient's bedside, however, the fees suggested by the American Medical Association Bluebook of 1892 do not suggest that Klehm ever became wealthy: Fairly standard fee for a delivery, fifteen dollars; emergency house-call, five to twenty-five dollars; fine dressing of superficial wounds e.g. sprains, five to twenty-five dollars. By 1918, Niles Center, soon to be renamed Skokie, was becoming more suburban than rural. Peaceful and productive, the little town boasted an auto dealership, a painter, and a photographer, as well as a butchery, a dairy, and even an insurance office run by Dr. Klehm's brother, George. There were also paved roads, so the doctor was able to see her homebound patients far faster than she had ever done before. This stood her in good stead that year, when the worldwide influenza epidemic struck. Dr. Klehm spent many frantic hours making rounds - fifty-one on one record day, according to her faithful sister and sometimes driver, Alma, an indispensable companion at such times. 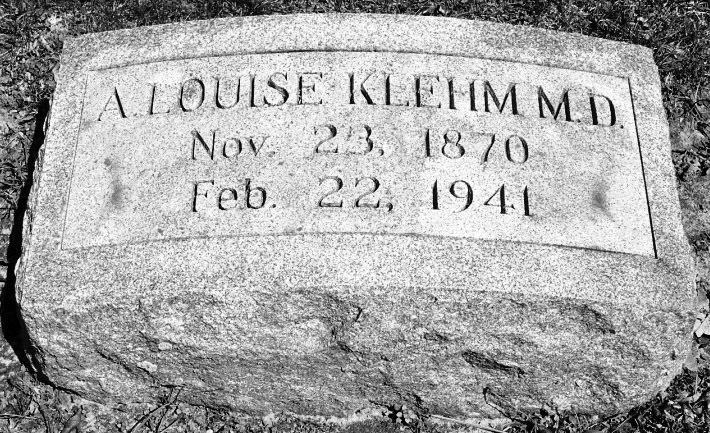 Louise Klehm, M.D., died in St. Francis Hospital from cancer on February 22, 1941, just months before the United States entered World War II. "Doc" known to countless old-timers who recalled her as she dashed madly up Lincoln avenue in her horse and buggy on her way to emergency calls. Saint Peters United Church of Christ Cemetery, Skokie, Illinois. Her funeral service, held on the afternoon of February 24th at the Haben Funeral Home, was attended by so many people that they overflowed into the upstairs living quarters of the Haben family. It was a fitting tribute to the Skokie's first lady of family practice. Further Reading: Skokie (Niles Centre), Illinois - Old businesses within a block radius from downtown Skokie's center.